You said no to hate. You said no to fear. You said no to a world without human rights. Over the past year, leaders have pushed hate, fought against rights, ignored crimes against humanity, and blithely let inequality and suffering spin out of control. This provoked mass protests, showing that while our challenges may never be greater, the will to fight back is just as strong. Amnesty International’s report, The State of the World’s Human Rights 2017/18, covers 159 countries and delivers the most comprehensive analysis of the state of human rights in the world today. While the findings remain shocking, it is the events such as those highlighted in the report that galvanised people across the world to stand up in the face of adversity and make their voices heard. In this climate, state-sponsored hate threatens to normalise discrimination against minority groups. Xenophobic slogans at a nationalist march in Warsaw, Poland and sweeping crackdowns on LGBTI communities from Chechnya to Egypt showed how the open advocacy of intolerance is increasing. Prominent among a sea of stories that caused shock were the horrific reports of ethnic cleansing carried out by Myanmar’s military against its Rohingya population. The stories captured by our researchers were utterly heartbreaking. “Shafi, my two-year-old son, he was hit hard with a wooden stick. One hit, and he was dead … Three of my children were killed,” said one woman, whose money, possessions – and children - were taken by soldiers. But with few leaders willing to stand up for human rights on a global stage, crimes against humanity and war crimes committed from Myanmar to Iraq have gone ignored, making the world a more dangerous place. Last year saw a record numbers of individuals come under attack for taking a stand against injustice. As a global organisation dedicated to fighting for human rights, we did not escape attack. Our own staff in Turkey were arrested and jailed on entirely baseless charges. While İdil Eser, Director of Amnesty Turkey, has been released, Taner Kılıç the chair of Amnesty Turkey, remains in prison. Imagine being a lawyer, journalist or activist, whose life is under threat for telling the truth. In 2018, we cannot take for granted that we will be free to gather together in protest or to criticize our governments. In fact, speaking out is becoming more dangerous. That is exactly what is happening right now, as authorities aggressively pursue people who have stood up for human rights. These activists are being killed in staggering numbers, with more than 312 killings recorded in 2017, up from 281 the year before. Despite the efforts of governments to shut down NGOs, undermine the media, take away people’s right to protest and jail campaigners, people refused to be silenced. And in this climate of fear and intimidation, it is all the more vital that we continue to speak out. People are angry, and rightly so, at the extraordinary anti-rights rhetoric being peddled by prominent leaders. 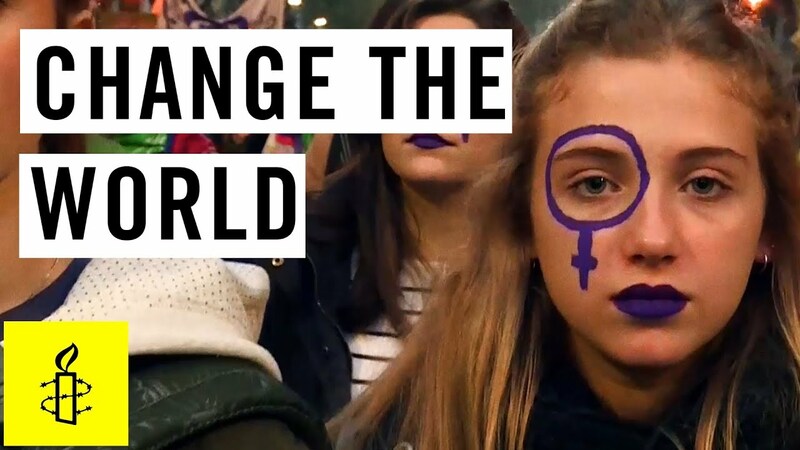 It is no surprise therefore that one of the largest protests for human rights in history – the Women’s March – took place last year, and set the scene for the year to come. With each and every protest, people proved they are passionate about defending institutions that uphold human rights. In Poland, serious threats to the independence of the judiciary brought incredible numbers of people onto the streets. Globally, the #MeToo phenomenon and Latin America’s “Ni Una Menos” – denouncing femicide and violence against women and girls – showcased the massive pull of social movements. Across the world activists scored important human rights victories, including lifting the total ban on abortion in Chile, achieving a step towards marriage equality in Taiwan and one by one, removing laws in Tunisia, Jordan and Lebanon that allowed rapists to escape justice. We’re making history, as people rise up and demand justice in greater numbers – and the onus is on the government to show they are listening. Join us now and make your voice heard. Make your voice heard. Become a member today.